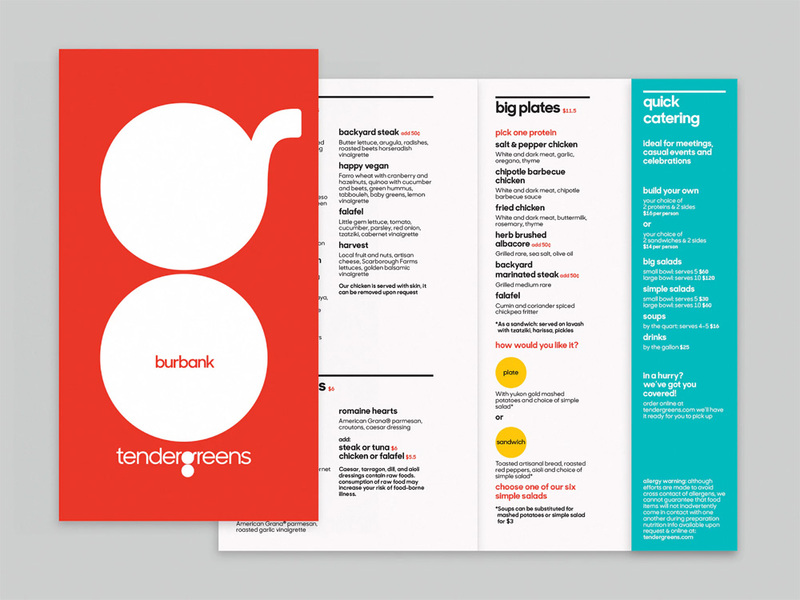 Established in 2006, Tender Greens is a group of fast-casual restaurants serving local, fresh food across 24 locations in California. Each restaurant is run by its own chef and the menus are different from each other, giving each location its own distinct, well, flavor. Next year, Tender Greens will open a location in New York and welcomes an investment from Union Square Hospitality Group, the group that brought Shake Shack to the world. 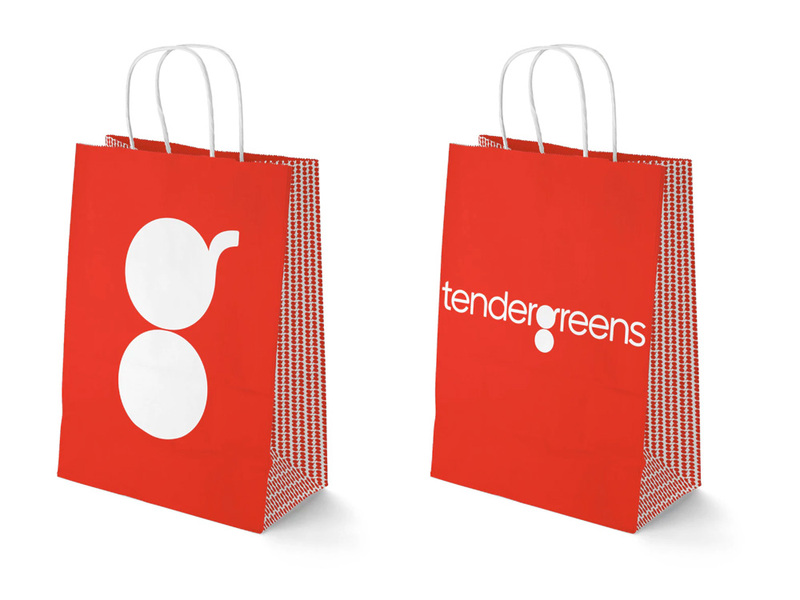 The new identity for Tender Greens has been designed by New York, NY-based Pentagram partner Paula Scher (who also designed the Shake Shack identity). 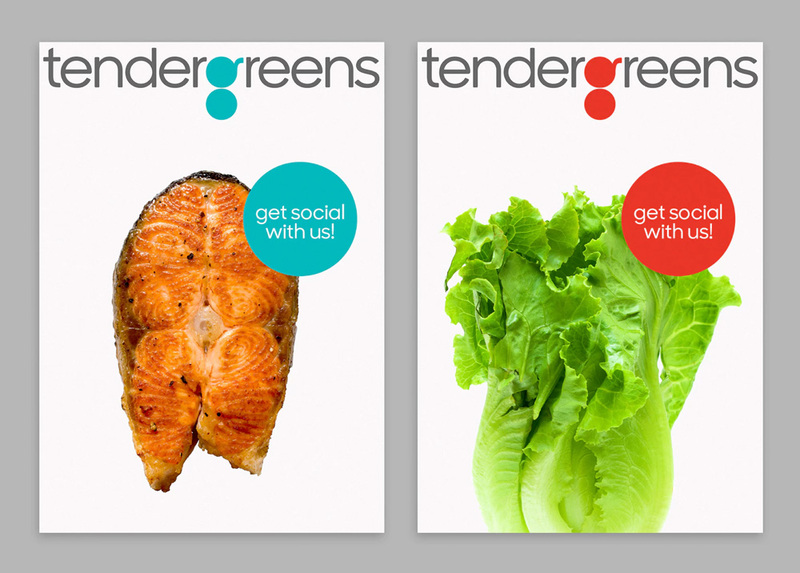 The Tender Greens brand identity answers several challenges. The Tender Greens name has great equity with the restaurant’s existing following, but does not accurately convey the menu, which goes well beyond salads and includes steak, chicken and fish. 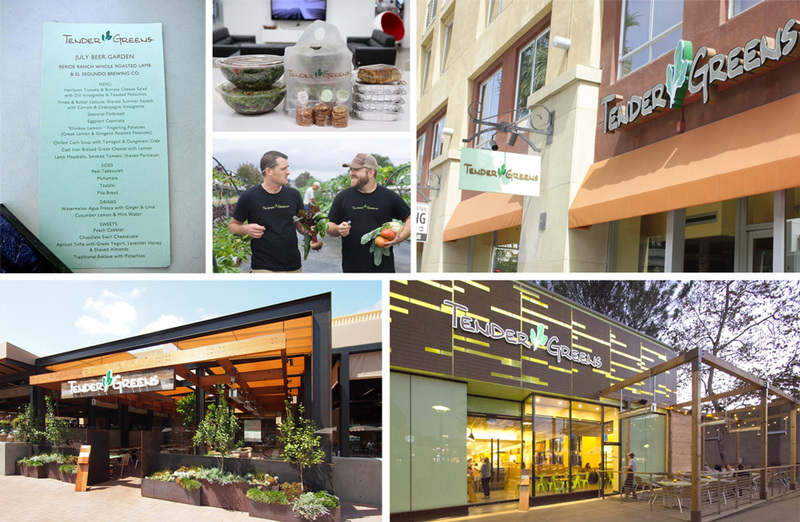 As Tender Greens grows, it wanted to showcase this wide variety of offerings to new customers. The identity also needed to establish a cohesive structure that would allow for differentiation across the various locations, which each feature their own menu, daily specials and products. The designers developed an iconic and instantly memorable logo—a distinctive lowercase “g” built of shapes that evoke a pan and plate. 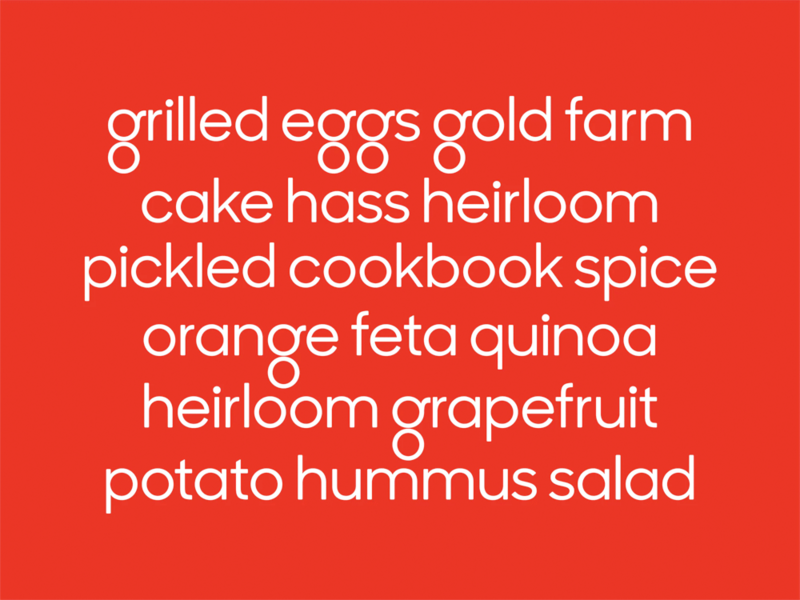 The round spaces of the “g” can be filled with color, or feature images of meals and food. The “g” can appear on its own as a symbol, or accompanied by the full wordmark, which is set in a customized version of the typeface Sharp Sans (with the “g” redrawn with round counters). The treatment of the “g” helps shift the focus away from the name as a whole and puts the emphasis on the food, where it should be. 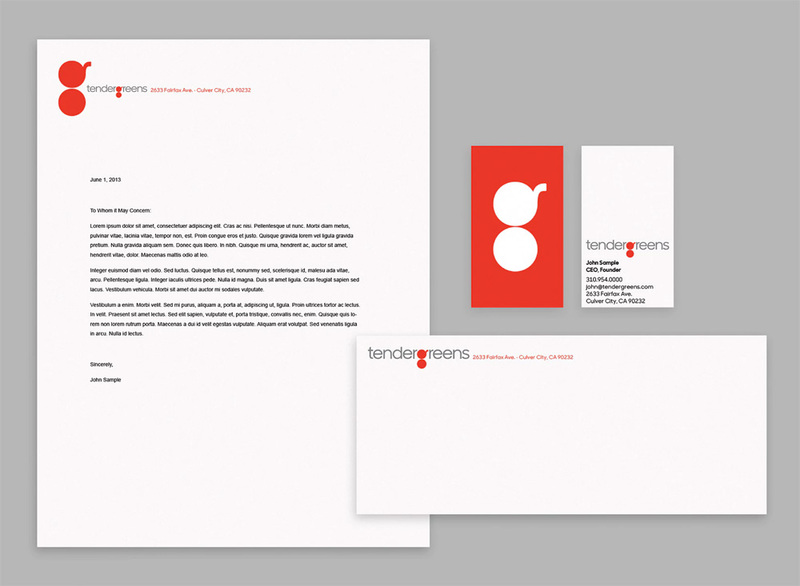 At the same time, the modern typographic approach helps set the brand apart in its category. The old was terrible, with a faux handwritten font that looked sloppy and grungy and a below-clip-art-level illustration of leafy greens. The lameness of the old logo was even more apparent when seen in the context of the locations, most of which are nicely designed and built. What it did communicate — in a crappy execution — was healthy foods, because lettuce. The new logo eschews any kind of farm-to-table or health-conscious signals in favor of establishing a more easily recognizable and marketable brand. 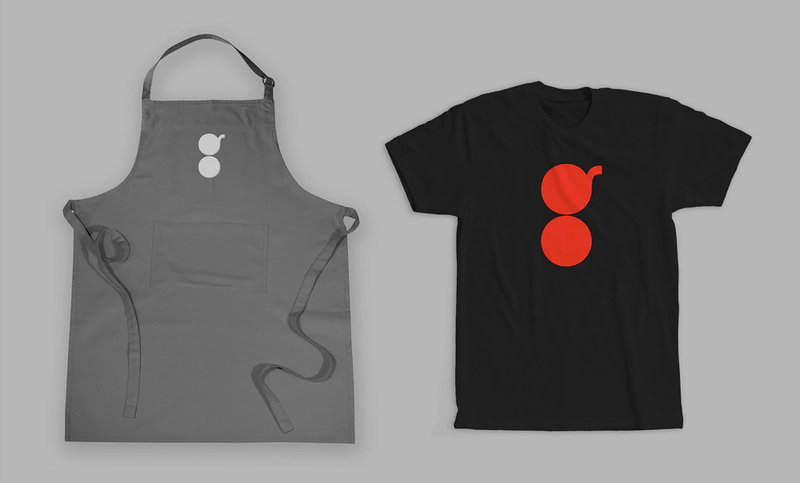 The focus of the logo is on the “g”, turning it into a pan and a plate icon that is fairly charming in concept and striking in execution because of the amount of “ink” it carries in its two large circles. I wasn’t aware of the existence of Tender Greens before this post and when I saw the new logo I thought it was a home and kitchen supply store, like Sur La Table, because I thought the upper part of the “g” was a tea kettle. I have never seen a pan with a curved handle so, as much as I want to, I keep having a hard time interpreting the “g” as a pan viewed from above. Maybe I’m being too literal. The idea plays better on the full wordmark because the ear of the “g” follows the shape of the curve of the “r”, so it’s easier to see the artistic freedom taken in the shape of the pan’s handle. I’m on the fence about the choice of red as the key color. It reminds me of this test: Green. I guess they were avoiding the obvious to make it green and moving to the opposite end of the spectrum goes more with the restaurant’s approach for breaking conventions. The monogram with stuff in it feels cheap with the silhouetted photographs of food and the long bits of lowercase text. The video alternative is a little more interesting as a mask but it’s still kind of lackluster. There is potential in these two ideas but it’s not resolved in a way that makes me go “Yeah!”. I wish there were more of this customized version of Sharp Sans. There is a great playfulness to the “g” when it’s not filled in as circles. It would be a pain for the copywriter to come up with a lot of words that have “g”s, but this is the most exciting image in the project. Carry-out bag. This should have had the pattern shown earlier. Santa Monica location with new look. The render applications are not the most exciting but they do establish the basic principle: the “g” monogram as big and red as possible wherever, whenever. It’s a simple strategy that plays out boldly in the applications shown directly above. The plastic cups, the carry out bag… they look great. The only weird thing is the repetition of the full logo under the large monogram; perhaps this would have been a good place to use the stroke “g” shown in the Typography image higher up in the post. Overall, this is a much needed redesign where the identity matches the quality of the physical spaces and the food in a playful and bold way and there are still a few ways to explore the “activation” of the spaces inside the monogram, which right now are undercooked. Thanks to Abe Vizcarra for the tip.